No one will face charges over the fatal Grayrigg train crash in Cumbria, British Transport Police have said. The last of three men, from Preston, Lancashire, arrested on suspicion of manslaughter, has been released from police bail without charge. 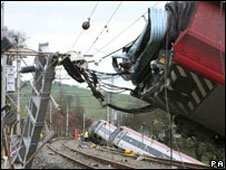 The February 2007 crash, involving a Virgin train, killed 84-year-old Margaret Masson and injured 22 others. The Crown Prosecution Service (CPS) said there was "insufficient evidence" to proceed with the investigation. Investigations showed faulty points were to blame for the tragedy. The train driver, Iain Black, from Dumbarton, suffered multiple injuries as the London to Glasgow Virgin Pendolino train careered down an embankment. A British Transport Police (BTP) spokeswoman said: "BTP can confirm that, following advice from the CPS, there will be no further action taken against the individuals arrested in relation to the Grayrigg incident. "They have, therefore, been released from police bail." An initial report by the Rail Accident Investigation Branch (RAIB) blamed a faulty set of points for the crash. A later inquiry by Network Rail, released in September last year, found systematic failures in track patrolling and management. Three rail workers were arrested, a 60-year-old and a 64-year-old, both from Tebay Cumbria, and the third, a 46-year-old from Preston, Lancashire, following the report. The men from Tebay were released without charge in November. Bob Crow, general secretary of the RMT union, which represents the rail workers, said: "The arrests were always a travesty and nothing more than a fishing expedition by BTP. "The shambolic attempt to finger individual staff was aimed at diverting attention from systematic management failings, highlighted by the investigation and the contract culture that still persists. "Lessons have not been learnt because safety is still under attack because of budget cuts and a massive squeeze on spending." A CPS spokesman said that no charges were brought due to "insufficient evidence". He said the CPS had also considered whether charges should be brought for gross negligence manslaughter against three individuals.